To think, the amount of times I’ve been to Norway now and I still had not seen the ‘tourist’ spots. There’s so much to do and so much to see, there’s no need to travel far. The whole country is beautiful. With so many people from home asking if I’d been to the more famous touristy spots, I was sick of saying “no”. So, with a few days holiday booked off work, we decided to take the car, the bikes and our running shoes on a mini road trip of Norway. We set off late on Sunday and arrived at the parking early Monday to an amazing sunrise. After making some breakfast and lunch, we set off on the 22km round trip towards the Trolltunga. The first kilometer is steep, wet and muddy and at this time in the morning, it was pretty dark and cold. However, the views were already pretty impressive. Once you pass the first steep climb, the gradient eases and provides an amazing panoramic view of the surrounding mountains. The terrain is mostly rocky with short sections over wet muddy ground. These are mostly covered by runner boards. Once you’re on the top, there’s an amazing cliff that you can walk along until reaching the Trolltunga. Note; the queue of tourists to the left of the Trolltunga. This was a quiet day and there must of been around 100 people standing having lunch and waiting for their photo to be taken. A queue allows for one person to go onto the tongue at a time for the perfect shot. Once they are done, they then go back onto the cliff to let the next tourist have their moment of glory. Some are more brave than others… and we’re told one one person has died from walking onto the tongue? – apparently when it was icy. Marin is pretty scared of heights, but it was enough of a slant to make her feel safe – even when putting her legs over the end. The red ‘T’ mean it’s hard to get lost. At the end of the day, we’d covered closer to 25km and we were both pretty beat. I’m amazed at how many tourists were wearing white basic trainers and fashion backpacks that were able to cover this distance. It wasn’t exactly a walk in the park. After the Trolltunga, we decided to set up the tent and camp out. The next day we had planned to drive up to Stryn. Using ferries, bridges and amazingly narrow coastal roads, we drove for most of the day through amazing scenery . It’s hard to imagine driving from sea level up and over a pass, past a glacier, and then back down to sea level again. All well within an hour. The wonders of Norway. We booked into one of the smallest cabins which had enough room for four and included a cooker, cutlery and a heater for those cold nights. Following advice from Folven owner, Fred Syversen, we head into the hills above Stryn to find some mazing views and awesome descents. It was at times a hard push to the top. We didn’t spend long before descending and we were in for treat. The first few hundred meters were perfect rock-based singlerrack with an awe inspiring view for the Fjord below. It’s pretty crazy looking straight down to the town below. Nothing like riding in the UK. Even though the trails were good, i’m not 100% sure we took the correct route. I think we might have gotten a little carried away. Carrying the bike down a cliff isn’t quite as fun. 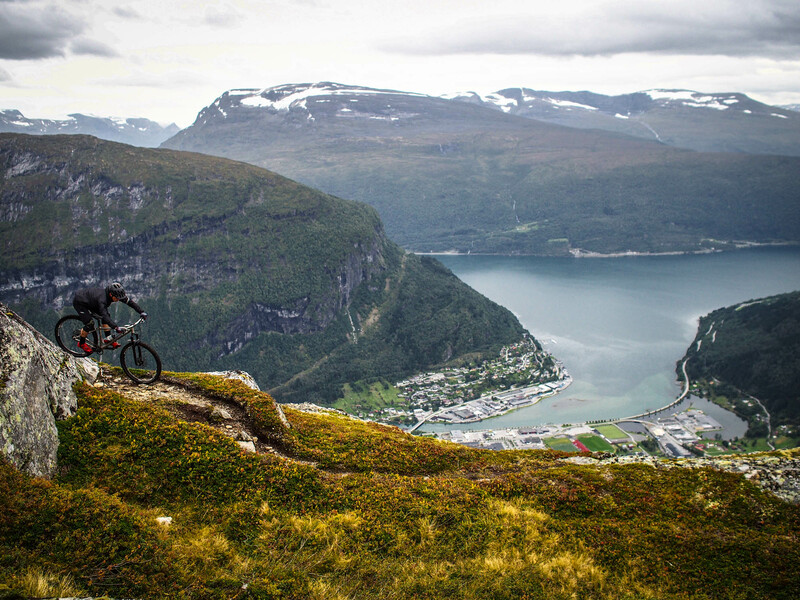 We staying in Stryn for another day, realising that there was so much riding to be had in this awesome little place. We could have stayed for a week. We went to the valley Erdalen. We’d heard a lot about this place from Fred and it just so happened that another couple from the camping place were setting off at the same time. After grouping up, we set off riding up and into the valley. Snow capped mountains lined the valley top with sun and flowers down below. Crazy to be so warm in the valley and for snow not to be far away. The glacier rivers towards the end of the valley were an impressive addition. Basically, you ride up the valley until you can go no further. Then you turn around and head back where you came.The ride can be as long or as short as you like. You’ve already pre-walked the descent so it’s good to know what is coming. The terrain is seriously technical the whole way and is a test for even the most experienced of riders. We booked into a small cabin close to the centre of town. I’d heard the town was one of the most beatutiful in Norway. We weren’t dissapointed at sunrise. The town was quiet. Tourists were nowhere to be seen. It’s not a big place but the buildings are nice with some quaint little shops. It had quite a different feeling to the previous days of walking and biking. The view at night was a highlight for me. The sunset was amazing. A perfect end to the mini road trip.